Merry Go Round, Black Diamond, See Saw, Triple Crown. Now Featuring additional line marking for 1.5” strip combinations. 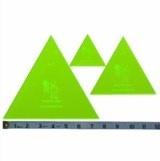 Includes Triangle wedge template and a 5-1/2” Equilateral triangle template for pieced triangle true up.